Gardener's Request: Can you give me any ideas on how I can move a Berberis thunbergii 'Orange Rocket' from one part of my yard to another? At right is a picture I took last year. Currently, it is 2-1/2' tall & wide and it has lots and lots of very sharp thorns. MGCC Help Desk Response: Thank you for contacting the UC Master Gardener Program Help Desk for advice on moving and transplanting your Berberis thunbergii 'Orange Rocket' to a new location. The key to moving and transplanting any thorny shrub is to wear protective gear to cover exposed flesh, including long pants, long sleeves, closed-toe shoes, thick gloves and even goggles. We suggest you start by lightly pruning the branches to make them a more manageable length (it is recommended to prune no more than 1/3 of the current size of the plant). Sunset Western Garden book says the best time to prune your barberry is spring and that it can be transplanted in either the spring or fall, but that spring is a better choice because the plant has all summer to recover and reestablish. Barberry do well in a number of different soil conditions and thrive even when moved around, as long as you don't over-water them. Choose a spot for transplant in an area of the yard that receives partial to full sun and has well-draining soil. Barberries prefer somewhat dry soil, and will not do well if their roots sit in water after a rain. Place your spade outside of the perimeter of the branches to get a large root ball on the barberry you're transplanting (hence the suggestion to prune the plant down a bit to make it more manageable). Move in a circle around the plant, setting soil aside, before shoving the spade underneath the root ball. Continue digging and loosening dirt until you can leverage the shovel under the root ball and pull the plant out of the hole. Dig the transplant hole twice as wide as the barberry root ball and as deep or slightly shallower. Use the spade to loosen the soil on the sides and in the bottom of the hole so the roots can easily spread out. Place the barberry in the new hole, spreading out the roots. Trim any roots longer than the width of the hole with pruning shears so all the roots fit without circling the root ball. Hold the plant in place as you back fill topsoil over the roots, taking care to leave the crown of the root ball exposed. Gently tamp down the soil to remove air pockets and make sure the bush is firmly in place. 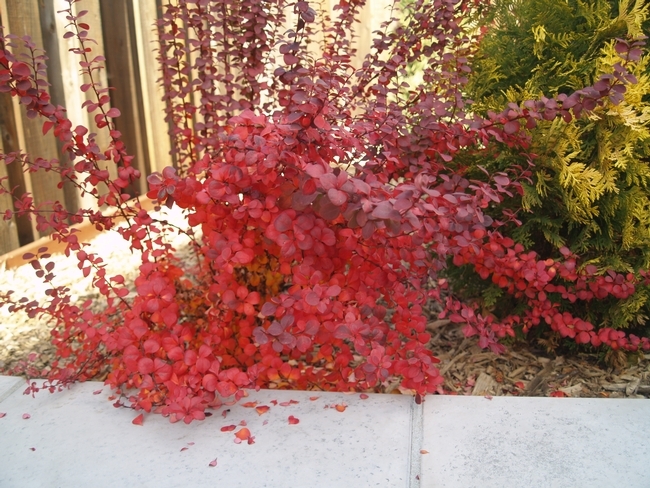 Water the barberry thoroughly, running water at the base of the bush until it pools. Allow the water to drain down into the soil. Repeat this process. Place a layer of mulch on top of the soil around the plant, but keep it away from the protruding crown. Mulch controls soil temperature and retains moisture between waterings. And that's all there is too it! Good luck with your transplant project! Having personal experience caring for Berberis, I want to emphasize wearing protective clothing. While I was aware of this cautionary advice given above, I found to my dismay that my apparently light weight denim jeans were not “protective”. I ended up with numerous somewhat painful puncture wounds on my legs that stayed around for several weeks.